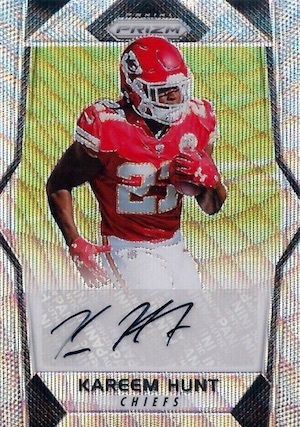 Putting a little extra pop into the NFL collecting season, 2017 Panini Prizm Football uses a tried-and-true formula of colorful parallels, wild inserts, and rookie autographs. Averaging three signed cards per hobby box, there are also nine numbered Prizm parallels (#/275 or less) to be uncovered. 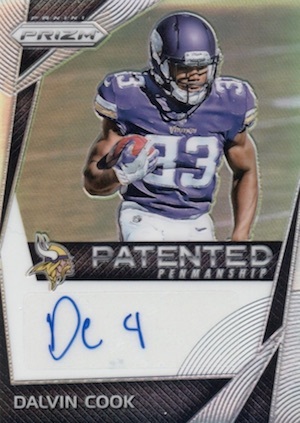 While the numbered Prizm cards per box does drop down one from the 2016 product, several new elements emerge in 2017, including debut additions to the Prizm autograph rainbow. There is also the 2017 Panini Prizm Football "1st Off the Line" box that contains a bonus Bronze Stars base rookie and autograph. 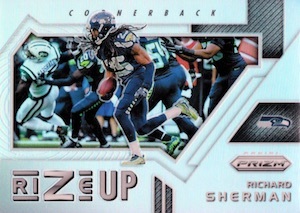 This limited parallel is exclusive to the format issued directly on the Panini website. Another selling point is that the boxes arrive at least one day ahead of the official release date. 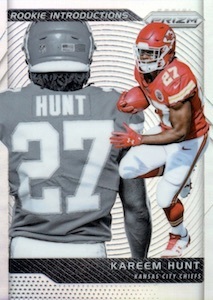 Like its predecessors, the 2017 Panini Prizm Football checklist is led by a base set filled with veterans and rookies. 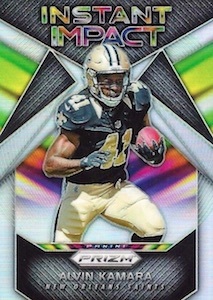 There is also no shortage of Prizm parallels, including Black Finite, Camo and Gold. In addition, retail collectors can find exclusive Red (Retail), Blue (Retail), Disco (Blaster) and Red/White/Blue Prizms (Fat Pack). 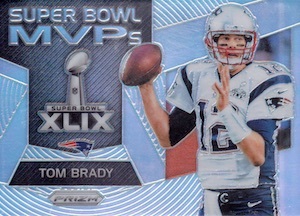 All utilizing the Prizm technology, the inserts are perhaps even more intriguing, with options like Illumination, NFL MVPs, Stained Glass and Super Bowl MVPs. More rare are the Black Finite and Gold Mojo Prizm parallels. 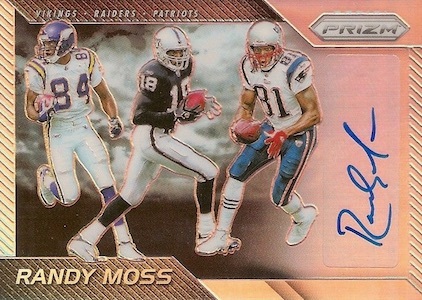 Remembering the acclaimed receiver as he nears Hall of Fame eligibility (in 2018), the Randy Moss Tribute set is only found in hobby formats. The 15-card insert includes one card for each season of his career, 14 in all, plus a signed card that has only 25 copies. Of course, we can't forget the 2017 Panini Prizm Football autographs! Forming the majority of the signed options, the Rookie Autograph Prizm set features new Green Scope, Purple Crystal and Red Power Prizm parallels. Retail exclusives are in play here, as well, with Disco (Blaster), Red/White/Blue (Fat Pack), and Green (Retail) Prizms. Hobby case-hit Rookie Patch Autograph cards, numbered to 99 or less, provide a rare auto relic choice in the release. These have Black Finite and Gold parallels. 2017 Panini Prizm Football is also part of the 2017 Panini Kickoff promotion that involves free packs. Check out the current 2017 Panini Prizm Football autograph listings on eBay. 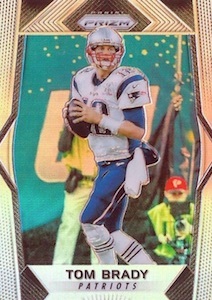 White Sparkle parallels are exclusive to Panini online packs. PRIZM PARALLELS: Prizm, Blue, Disco, Green, Pink, Red, Red/White/Blue, Orange #/275, Light Blue #/199, Blue Wave #/149, Green Scope #/99, Purple Crystals #/75, Red Power #/49, Camo #/25, White Sparkle (20 copies or less; Online Packs), Gold #/10, Bronze Stars (6 copies; 1st Off Line), Gold Vinyl #/5, Black Finite 1/1. 100 cards. 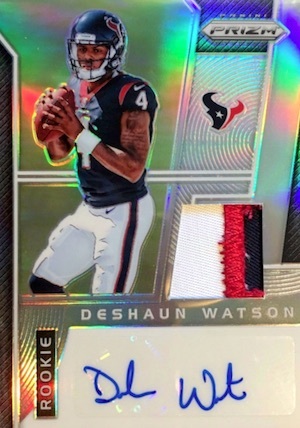 Shop Prizm NFL rookie autographs on eBay. 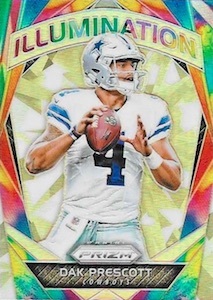 PRIZM PARALLELS: Disco, Green, Pink, Red/White/Blue, Blue Wave #/149 (No Bucky Hodges**), Green Scope #/99 (No Bucky Hodges**), Purple Crystals #/75 (No Bucky Hodges**), Red Power #/49, Camo #/25, Bronze Stars (20 copies or less; 1st Off Line), Gold #/10, Gold Vinyl #/5, Black Finite 1/1,White Sparkle 1/1 (Online Packs). PRIZM PARALLELS: Red Power #/15, Gold Mojo #/10, Black Finite 1/1. PRIZM PARALLELS: Green, Gold Mojo #/10, Black Finite 1/1. PRIZM PARALLELS: Gold Mojo #/10, Black Finite 1/1. PRIZM PARALLELS: Gold #/10* or #/5, Black Finite 1/1. 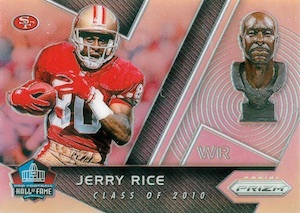 PRIZM PARALLELS: Pink, Prime #/25, Super Prime 1/1. 14 cards. Hobby only. Shop on eBay. Why can’t we get a checklist more than a day before release? It has become a joke. Corey – Actually, this is the best they have ever been in providing the checklists publicly. Almost all checklists for new releases have been released at least 1 day in advance. The same day of release times are now the exception. And i believe they only do this now due to the rise of Pick Your Team Group Breaking. Question – if the release date is tomorrow, how in the world are all of these cards all over ebay already. Is that legal? I’d like to know just in case I want to pursue this. Jim: New releases showing up a day or two early is not uncommon, especially for Topps. In this instance, it’s because Prizm is part of the “1st Off the Line” format which means the cards arrive 24 to 48 hours before the official release and include extra Bronze Stars cards that are only found in those boxes. Pros: Beautiful looking cards. Great set for those who like to make rainbows. Cons: Base heavy. Very limited on variety if hits. Colored parallels being the draw to the set show a lack of creativity from the design team. Absolute garbage. Filled with no-names and scrubs alike. All sticker autos so if you hit a fournette you will probably only get about half of the auto. Please dear god don’t buy a box of this and don’t buy a team with a well known rookie in a group break. 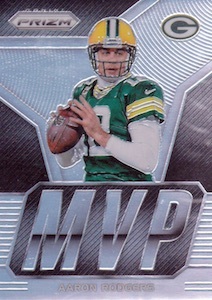 For a product that is supposed to grade well, the centering on the cards is the worst I have seen in a long time. Plus tons of scrub sticker autos and basically the same design as last year. How unoriginal!! This is the worst 120.00 I have spent on a box. I ordered a box from panini direct and it took a week to receive my dud box. My 3 big autos were Desmond king, demarcus walker bronze, and Joshua Dobbs. The base rookies I only pulled Kareem hunt. Colored prisms were also all duds. The best card I pulled was a dark Prescott illuminator. Save your money and just buy the cards or autos you want. Panini need a to shorten the 100 card rookie auto list. Too many defensive players. @Burned again: Where have you been for the past 10 years of the hobby? Release is the WORST time to buy any product, and the autos you got don’t sound terrible. The fact they increased the Hobby hits to 3 autos from 2 from the previous years is actually a nice change. If you REALLY want to buy boxes of it, wait for a few months and they’ll be at 50-60 a box, which lessens the sting of the cost a bit. Wish I could get in more on this product, but unfortunately finances aren’t allowing me to. Have a few singles I’ve purchased, and haven’t been disappointed – was worried I wouldn’t like the design compared to 14, 15, and 16 but actually do. What happened to legends being in base set? I know there is hall of fame insert but with only 3 parallels??? so much for making rainbow sets of favorite legends like Bradshaw, Rice, Elway… etc…. whatever?!? Got a red white blue fat pack always had liked those Parallel card ..comes w few packs and then white pack w 3 red white blue cards ..none of which are Refractors or Prizm Prizm to use correct term ..how come ?? Though that was whole reason to advertise red white blue bc they are only retail and cool looking Refractors ..been buying Prizm since 2012 football and basketball and rwb were always Refractors ..Any reason why this are just parallels ..plus every rookie in each pack was Refractor …making me think it’s base set and then all 100 rookies are Refractors ??? Then got target exclusive box pink auto/ pink jersey and 3 pink parallels ..no Auto but 150 points and again every rookie was Refractor which is great looking but thinking how hard it use to be to hit Refractor rookies ..hit pink Kareem jersey ..2 other pinks vets both Refractors and one pink rookie Refractor ..ate all rookies Refractors in this product ??? Can anyone help me. How many Deshaun Watson autographed red white and blues are there total. I just saw one sell for $2k and I think that was low. These are great cards but I have a question instead of a review. Does anyone know if some of the short prints are the same as last year’s Prizms? Last year the green autos were limited to 26 copies and the pink autos were limited to 100 copies. (Last year also had flash autos limited to 14 copies and I believe red/white/blue autos limited to 11 copies) If anyone knows if the green and pink autos are limited to the same amount as last year, please let me know. I don’t know if I’ll be able to see a response on here so my email is grantmb17@gmail.com, if you could let me know I would greatly appreciate it! Thanks! Bought 1 box, pulled the Leonard Fournette Finite 1/1, sold it for a grand on Ebay to a Fournette fan. Also got a redemption Disco Joe Mixon. Love it. I bought a hobby box the other day, and pulled a Patrick Mahomes green autograph. Everywhere I have read is that these are retail exclusive? It was def a hobby box that I bought, but I am certainly not upset about it. I also pulled 3 other autos and a rewards points card out of the box too. So basically pulled 5 autos out of the box, so this was an all around great box!